I picked up a Kawasaki KZ 440 that needed some work, though I didn’t know what kind. The bike came with a parts motor, and chances are, if a bike comes with a parts motor, something is wrong with the motor in the bike. When I got home I checked the compression and bingo, 90+- psi on each cylinder. Terrible. I got lucky though that this is the only problem I found with the motor. Over the next 6 hours or so I completely tore down the top end of both KZ440 motors I had. I visually inspected each part and chose the best pieces I had. I didn’t measure ANYTHING. I even pulled off all the rings, mixed them up, then visually inspected the wear and varnish on each to select the best ones to use. Both motors were used a fair bit but not awful. The motor in the bike had 25,000 miles on the clock, the other I’m not sure. So I rebuilt the motor in the bike using all the mix-matched parts. I didn’t buy a single new part. I even reused the gaskets. 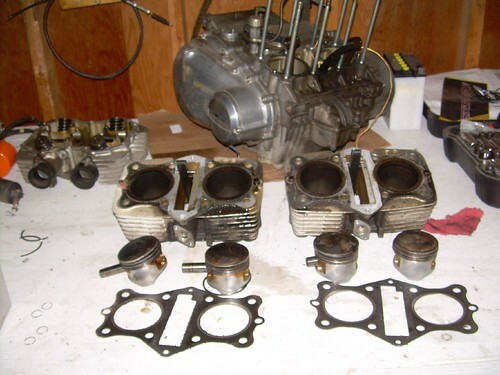 The gaskets got ripped to hell when I was pulling the heads and cylinders, but as long as you clean them carefully and apply generous amounts of gasket sealant on both sides, they can (can, not should) be reused. Doing what I did isn’t generally considered good practice, but for an old bike that isn’t worth much, there’s no point in dumping money into it. Best bolts for use on a Comstar Wheel? Suggestions for a 1985 ZL 900 Elminator?